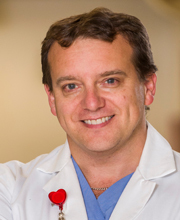 Chris Simpson is Professor of Medicine and Chief of Cardiology at Queen’s University as well as the Medical Director of the Cardiac Program at Kingston General Hospital / Hotel Dieu Hospital. In 2015, Chris was elected to fellowship in the Canadian Academy of Health Sciences. He is the Past President of the Canadian Medical Association (CMA). A New Brunswick native, Chris obtained his MD in 1992 from Dalhousie University, and completed Internal Medicine and Cardiology training at Queen’s. He subsequently completed a Heart and Stroke Foundation Research Fellowship in Cardiac Electrophysiology (heart rhythm disorders) at the University of Western Ontario under the supervision of George Klein. He served as the first President of the Canadian Heart Rhythm Society and was a founding executive member of the International Coalition of Pacing and Electrophysiology Organizations (COPE). He sits on numerous editorial boards and advisory committees, and has chaired or been a member of several national and international consensus conferences, including serving as co-chair of the CCS Consensus Conference on Medical Fitness to Drive and Fly. He was President of the Canadian Medical Association in 2014-2015 and is a past recipient of the Canadian Medical Association’s Award for Young Leaders. Chris is an active clinician, educator and researcher. He has authored or co-authored over 350 peer-reviewed publications. His clinical and research interests include access to care, medical fitness to drive, referral pathway development, atrial fibrillation, sudden death in the young, and cardiac resynchronization therapy.